Every year at Christmas time, Laura makes gifts from the kitchen for her friends. Her homemade granola packed into a decorated Mason jar is always a hit as are her cookies. This year, she made this beautiful ruby red (I guess that’s cranberry red) conserve to serve along with her homemade Raincoast Crisps and baked brie. It also makes a perfect filling for a thumbprint cookie. While it requires a lot more sugar than we are used to using, we justified it by saying, “It’s Christmas”. 1. Zest the oranges and lemons and place in a large saucepan. 2. Finish removing the peel from the oranges and lemons, quarter them and put them into the bowl of a food processor. Pulse just until chunky. Add to the saucepan. 3. Add the sugar, cranberries, raisins, cinnamon, allspice and cloves and bring to a boil. 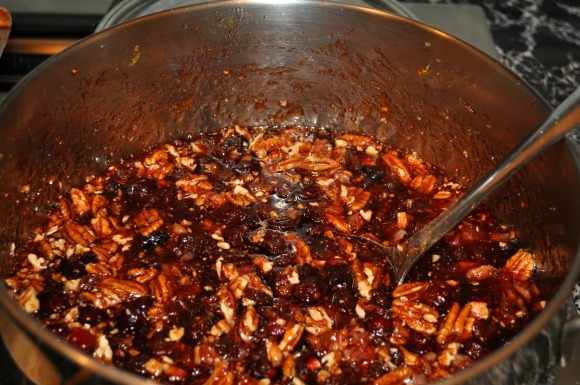 Reduce the heat and simmer for 20-30 minutes until the mixture thickens and the cranberries pop. Cranberries have a lot of natural pectin, so the mixture will continue to thicken as it cools. 4. Remove from the heat, remove the cinnamon sticks and stir in the pecans. 5. Ladle into sterilized jars and store in the frig for up to 4 weeks, or freeze for longer storage. Serve with crackers and sliced cheese or goat cheese or baked brie. Fill the center of a thumbprint cookie or just spoon it over ice cream. 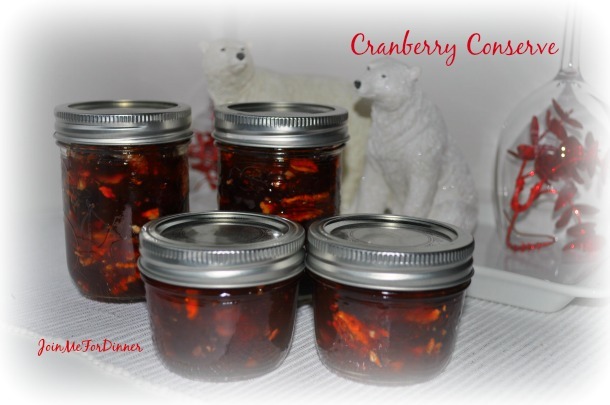 This entry was posted in appetizers, Christmas, preserves, sauce and tagged Christmas gifts from the kitchen, cranberry orange conserve, cranberry preserves. Bookmark the permalink.